How many young women have heard 'Those Three Words'? For some, the words 'you are pregnant' bring indescribable joy. For others, like Christine Bauer, they cause panic and heartache, beginning a journey of fear, indecision, distressing physical changes, and emotional turmoil. 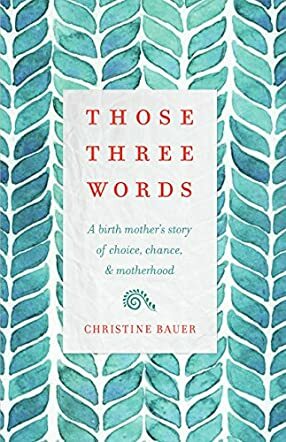 Christine Bauer takes us with her on the journey that begins with those words - a tumultuous journey that, eventually, delivers her to a place of great joy and happiness. Those Three Words is a birth mother's story of choice. It's a story that plumbs the depths of emotion experienced when at just 18 and unmarried - just starting her first year of college - Christine faced an unplanned pregnancy. As she struggles to come to terms with the reality that a child is growing insider her, she wrestles with the options available to unwed mothers, finally deciding to offer her baby for adoption. Christine was more fortunate than many who face an unplanned pregnancy. Supported by a close and loving family, she lived in a world filled with love, care and kindness. But under any conditions, the decision to surrender a child must be one of the most difficult any mother can make. That agonizing decision will leave an emptiness in the heart that can never be filled. It's a decision that will affect her and her family for the rest of their lives, and Christine holds nothing back as she details both the suffering and the joys: the reactions of the parents and siblings she loves, the child's father, the man she marries, and the two sons she bears. The test of the quality of a memoir is how well the writer connects with the reader, taking them along on the journey and letting them share the character's deepest emotions, think the character's thoughts... walk in the character's shoes. Christine Bauer succeeded so well that I struggled to read through my tears. I cried when she suffered, and I cried tears of joy when fate, her love, and the love of those who shared her struggle, showered her with blessings. Christine handles the controversial topics of abortion, birth control and women's rights sensitively. Her story shines a light on the potential merits of open adoption. I have read sad stories of birth mothers who lost their child forever and of children who struggled to fill missing pieces of themselves. Christine's story presents a different view. Examining open adoption from the perspective of mother, mother's family, child and adoptive parents, she inspires us to consider the potential for a joyful outcome for all. Those Three Words is a beautiful story, written with impressive honesty and sincerity by a master of evocative copy and vivid description - a story that touches the heart.